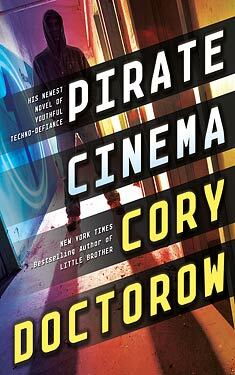 If you liked Pirate Cinema you might like these books. My bedfellows in the shelter--all boys, girls were kept in a separate place--ranged from terrifying to terrified. Some were proper hard men, all gangster talk about knives and beatings and that. Some were even younger looking than me, with haunted eyes and quick flinches whenever anyone spoke too loud. We slept eight to a room, in bunk beds that were barely wide enough to contain my skinny shoulders, and the next day, another old dear let me pick out some clothes and a backpack from mountains of donated stuff. The clothes were actually pretty good. Better, in fact, than the clothes I'd arrived in London wearing; Bradford was a good five years behind the bleeding edge of fashion you saw on the streets of Shoreditch, so these last-year's castoffs were smarter than anything I'd ever owned. They fed me a tasteless but filling breakfast of oatmeal and greasy bacon that sat in my stomach like a rock after they kicked me out into the streets. It was 8:00 A.M. and everyone was marching for the tube to go to work, or queuing up for the buses, and it seemed like I was the only one with nowhere to go. I still had about forty pounds in my pocket, but that wouldn't go very far in the posh coffee bars of Shoreditch, where even a black coffee cost three quid. And I didn't have a laptop anymore (every time I thought of my lost video, never to be uploaded to a YouTube, gone forever, my heart cramped up in my chest). I thought dismally that I would probably have to join them soon. I had never had a real job and I didn't think the nice people with the posh film companies in Soho were looking to hire a plucky, underage video editor with a thick northern accent and someone else's clothes on his back. How the bloody hell did all those tramps earn a living? Hundreds of people had gone by and not a one of them had given a penny, as far as I could tell. The PCSOs disappeared into the distance, ducking into the Starbucks or getting on buses, and the tramps trickled back from their hidey holes. A new lad stationed himself at the bottom of the stairwell where I was standing, a huge grin plastered on his face, framed by a three-day beard that was somehow rakish instead of sad. He had a sign drawn on a large sheet of white cardboard, with several things glued or duct-taped to it: a box of Kleenex, a pump-handled hand-sanitizer, a tray of breath-mints with a little single-serving lever that dropped one into your hand. Above them was written, in big, friendly graffiti letters, FREE TISSUE/SANITIZER/MINTS--HELP THE HOMELESS--FANKS, GUV!, and next to that, a cup that rattled from all the pound coins in it. As commuters pelted out of the station and headed for the stairs, they'd stop and read his sign, laugh, drop a pound in his cup, take a squirt of sanitizer or a Kleenex or a mint (he'd urge them to do it; it seemed they were in danger of passing by without helping themselves), laugh again, and head upstairs. "Jem Dodger," he said. "Gentleman of leisure and lover of fine food and laughter. Pleased to make your acquaintance, guv." He said it in a broad, comic cockney accent and even tugged at an invisible cap brim as he said it. I laughed. "In the world, son. Forgive me for saying so, but you have the look of someone who's just got off a bus from the arse-end of East Shitshire with a hat full of dreams, a pocketful of hope, and a head full of grape jelly. Have I got that right?" "Mate," he said, and he lost the cockney accent and came across pure north, like he'd been raised on the next estate. "I am you. I was you, anyway. A few years ago. Now I'm the Jammie Dodger, Prince of the London Byways, Count of the Canalsides, Squire of the Squat, and so on and so on." Another train had come in, and more people were coming out of the station. He shooed me off to one side and began his smiling come-ons to the new arrivals. A minute later, he'd collected another twelve quid and he waved me back over. "Now, Master McCauley, you may be wondering why I called you over here." I found his chirpy mode of speech impossible to resist, so I went with it. "Indeed I am, Mr. Dodger. Wondering that very thing, I was." He nodded encouragement, pleased that I was going along with the wheeze. "Right. Well, you saw all the other sorry sods holding up signs in this station, I take it?" "None of 'em is making a penny. None of 'em know how to make a penny. That's cos most of the people who end up here get here because something awful's gone wrong with them and they don't have the cunning and fortitude to roll with it. Mostly, people end up holding a sign and shaking a cup because someone's done them over terribly--raped them, beat them up, given them awful head-drugs--and they don't have the education, skills or sanity to work out how to do any better. "Now, me, I'm here because I am a gentleman of leisure, as I believe I have informed you already. Whatever happened in my past, I was clever and quick and tricksy enough to deal with it. So when I landed up holding a sign in a tube station hoping for the average Londoner to open his wallet and his heart to buy me supper, I didn't just find any old sheet of brown cardboard box, scrawl a pathetic message on it, and hope for the best. "No. I went out and bought all different kinds of cards--bright yellow, pink, blue, plain white--and tested each one. See?" He reached into the back pocket of his jeans and drew out a small, worn notebook. He opened it to the first page and stuck it under my nose. It was headed "Colors: (HELP THE HOMELESS)" and there were two columns running its length, one listing different colored cardboards, the other showing different amounts. "Look at that, would you? See how poorly brown performs? It's the bottom of the barrel. People just don't want to open their wallets to a man holding a sign that looks like it was made out of an old cardboard box. You'd think they would, right? Appearance of deserving thrift an' all? But they don't. They like practically any color except brown. And the best one, well, it's good old white." He rattled his sign. "Lots of contrast, looks clean. I buy a new one every day down at the art supply shop in Shoreditch High Street. The punters like a man what takes pride in his sign." Another tubeload of passengers came up, and he shooed me off again, making another twentysome pounds in just a few minutes. "Now, as to wording, just have a look." He showed me the subsequent pages of his book. Each had a different header: HOMELESS--HELP. HUNGRY--HELP. HELP THE HUNGRY. HELP THE HOMELESS. DESPERATE. DESPERATE--HELP. "What I noticed was, people really respond to a call for action. It's not enough to say, 'homeless, miserable, starving' and so on. You need to cap it off with a request of some kind, so they know what you're after. 'Help the Homeless' outperforms everything else I've tried. Simple, to the point."